Feed the Children–Since God Doesn’t. John Loftus recently posted the following dark-humored picture on facebook. 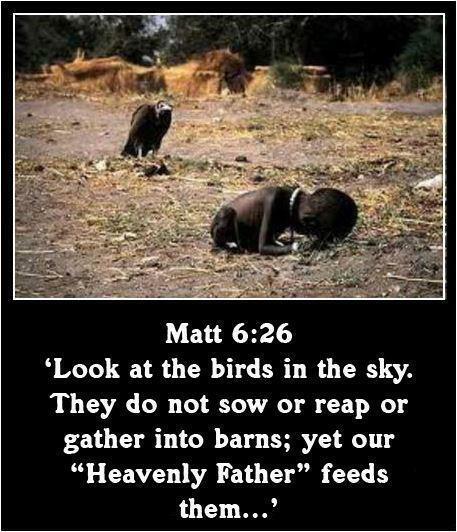 As can be expected, many people chimed in in full agreement with how wicked God would be, and how brutally ironic it would be to answer the vultures hunger with a starving child. As a Christian I’ve gotten used to these kinds of “thumb-in-the-eye” jabs at God’s goodness. So I’m not surprised. I’m even a little amused. I have a dark humor myself. But getting down to business let’s be clear: there is plenty of food for that child if it weren’t for other humans getting in the way of it. We do not have a food-production problem we have a food-distribution problem. The earth is not overpopulated and it’s not projected to be overpopulated any time soon (unless you cook the numbers, see “How to Lie with Statistics”), our food production capabilities are more than enough to address the needs of all the countries, including third world countries. Look at the political regimes, religious standing, and the family life of the countries where starvation is the worst, and invariably you will find serious socio-political problems that make it very very difficult for people to freely use the land to produce the food to feed the people. It’s no accident that mass starvation in Russia was preceded by a communist takeover, or that malnutrition and social poverty reign in places like Somalia where the free-trade of western civilization has been forced out through years of tribalistic warfare and exclusivistic forms of Islam. The strongest correlates with escaping poverty range from the “duh” obvious to the politically incorrect. 1) Don’t drink or do drugs–these are expensive addictive behaviors that don’t serve the lower economic classes very well. 2) Get married–traditional marriage correlates strongly with high income and material success. Theorists disagree over why this is so, but for whatever reason, married couples tend to do better at investing, saving, and generating income. Practically, this means that poverty is more common when folks decline traditional marriage or family in favor of a “serious boyfriend” or a child out of wedlock. On a related note be good to your family of origin, you never know when you might have to move back in with your parents one day, or you might need your children or siblings to take care of you in the event of a break down, injury, or old age. 3) Join a church (not just any church but a catholic or established evangelical church or even a mormon church)–poverty is very common among nominal believers or followers of Hinduism Buddhism where indifference is praised as a virtue in the west. While secularism is not itself a very strong correlate, secular governance correlates strongly with poverty in China, Russia, North Vietnam, North Korea, Fascist Italy (p.s., I mean “secular governance” in the strict sense–not in the sense of Sweden or Norway that have deeply Christian heritage, and state religions, etc.) Nowadays, in Western Europe for example, secularism is sort of the “leisure activity” of centuries of judeo-Christian heritage where free-trade and human rights are part of our cultural DNA. Genuinely atheistic governments are a stronger example of what secular governance really looks like, and the picture is gaunt and corrupt. 4) Get an education (assuming one has access to it). Education is broadly good and worthwhile for its own sake BUT, not just any book-learning will put food on your plate. Seek a useful education too, not just a humanities core or something that won’t necessarily translate into hirability. I’m a huge advocates of liberal arts and the humanities, but first things first. Everyone should have some job-ready skills so they can earn some money to feed their family. Some Philosophy majors (like myself) or English majors, might do well to get a minor in business, or get certified in a craft on the side, or seek a different major altogether such as teaching English as a second language, or Internet Technology, or Computer Programming, or food service. 5) Move out of the desert–this should go without saying but if you live where there are few resources to live on, find a way to move elsewhere. Central and Northern Africa is often overrun by tribal and islamist warfare, but there are liable to be neighboring countries with better resources well-south of the Sahara. Better to be a migrant worker than native and jobless. Move in SE asia and indonesia move away from flood planes where a lifetime of work is liable to be washed away with the next big rain. In Haiti, move to neighboring Islands where the government is more stable, the economy is stronger, and there is a better chance of digging out a sustenance. To Loftus and others who dwell on the Problem of Evil, I would say to keep lamenting poverty all you want, and keep blaming God for it, but God put us people in charge of a lot of it (Gen 1:26ff). People are equally or more to blame since we’ve forbidden or scandalized some of the most historically reliable answers to this classic problem. All of this is easier said than done. And coming from the comfort of my living room couch it sounds light and airy, like ivory tower intellectualism that has no need to touch ground. But even we affluent Americans (or anyone with internet access, money in the wallet, and food on the table) can help solve poverty locally by earning our money, investing it carefully, sharing it wisely, and seeking tactful means of sponsoring non-profits and NGO’s that feed the hungry–often by bypassing the extra “middle-men” in third-world governments who are liable take a cut of the profits. These correlates are features typically found among people who are not poor or who have escaped poverty. it would be an overstatement to treat these simply as CAUSES. Statistically and practically, all that can be said is that these sorts of things correlate with non-poverty. Where are you getting these correlates from? You just made them up, I guess? The bit about “join a church” is, admittedly, a bit sweeping but it holds true on large scale (i.e., nationally speaking–Western Europeans and U.S. Americans having a broadly judeo-Christian enculturation tend to fare better financially than India, China, Indonesia, Russia). On a small-scale or local level, there are liable to be many many exceptions and counter-examples, where for example, people come from a catholic neighborhood but most people there are nominal or non-practicing–but the neighborhood is fairly wealthy. And Arab Muslims who live in the oil belt tend to fare well to, as the natural resources of the Arabian peninsula is so rich it overcomes Sharia obstacles to free-trade. Still, several reports corroborate the claim that the wealthier countries tend to have Judeo-Christian backgrounds. The Wikipedia report on GDP agrees with Forbes. Also, the point about “get an education” is also common knowledge. Most every indexical of material success goes up, statistically, when people complete their high school education, and then up again when they complete a college degree. The point about “don’t drink or do drugs,” that’s meant to point out that drinking and drug usage are probably not the best use of money if someone is already poor, especially if they are done to the point of addiction. But I would not claim at all that rich people are teetotalers or devoid of recreational drug use. I do not find these sources very accurate or convincing. The first two deal with the United States only, from what I can tell and and the other two do not make your point. For example some of these richer more prosperous countries have very low levels of belief in a deity or anything resembling a religious culture. Yes, they have a legacy of state religion and many indicate a religious affiliation on censuses, but the churches are pretty empty and often re-purposed. For example, Sweden, Denmark and Norway have levels of theism believe in a god a the rate of 23%, 31%, and 32%, yet they manage to rate quite well in terms of average income. Whereas the Phillipines, with some 80% Catholics has likely the lowest average income in Asia, which is saying something. We can also look at rich Saudi Arabia with 100% theists, but Somalia also ranks at 100%. So maybe levels of belief do not track so well as oil wealth as you noted. Look, the picture you posted is of a child dying of hunger, likely in sub-Saharan Africa. The “correlates” you bring forward show a real lack of understanding of the problems facing people in these regions who are often very religious, with high levels of marriage and desperately want to move and get an education. The point on evil is simply a refutation of a god who wants to end this suffering and has the power to, but doesn’t. I’m not making the extensive claim you think I am. My point about church was supposed to distinguish the generic hindu/buddhist/chinese-communist from the Western European/American who has a rich Christian history to stand on. I’m not going into it here, but I tend to think that affluent atheism is the luxury of individuals from long-standing Christian culture. It’s a societal phenomenon equivalent to a teenager who wants to take his inheritance early and move out of the house. He can then claim it’s “his” but only insofar as he do borrows/steals/receives it from a different source. I’m just asserting that, undefended, here. I’ll save that contention for another day. I spoke to your point about Saudi Arabia already. Economically, it’s a shallow kind of wealth that is PURELY depending on natural resources but is highly self-restricted by it’s commitment to sharia economics (i.e., a pre-corporate code). Yes, they have success but it’s far more contingent than that of free-trade economies. And for whatever reason, judeo-christian societies have fared pretty well with free-trade. An overarching problem is that atheism only fares well in highly religious contexts, such as the deeply religious/occult worldview of china (i.e., chinese atheists are known to plan their children’s birthdays so correspond to “lucky” months, to consult astrologists on a daily basis, wear and decorate with good luck charms, practice taoism, buddhism and confucianism religiously even while they claim they are not religious). And the underground church in China is growing wildly there. The human rights violations are attrocious, and China also is economically propped up by its decidedly non-communist, non-secular, Hong Kong and Taiwan. The secularism in the Nordic countries and the rest of Western Europe is not a good sample of secularism either since many of those countries have state religion, religiously shaped/influence law codes, deeply religious histories, a highly influential church presence, and are only “secular” in limited and narrow senses (i.e., separation of church and state, for example). I fully admit that atheists can be moral, but when there are thoroughly secularized atheist nations–where religion has been expunged and thus rendering a true example of what secular society looks like, those also happen to be some of the most brutal regimes in history, contrary to the utopian dreams they had at the start. See, the Bohlshevik (sp?) revolution or the Killing Fields of Cambodia or the Maoist revolution, for example. You seem to think that the lack of a belief in a god is somehow a driving force in the world-views of atheists. I really do not think it is. Myself I am a secular humanist, a world-view that does not require atheism. In this context atheism just means one less, I would say irrelevant factor to consider. Religion just doesn’t seem to be much of a factor in poverty. If anything, the more secular countries tend to have better education, less want and social problems. The US being the big outlier. I agree the real causes are likely conflict, corruption, post-colonialism, these are deep systemic issues that make countries fragile to shocks like famine and war. It just seems a little insensitive to suggest that kids dying of hunger in war-torn Congo consider getting off drugs, getting an education, moving from the desert etc. 42Olon, oh I see now. I wasn’t reading close enough originally. When you were asking me for sources, i was taken aback wondering why you thought that education, and geography don’t even correlate with poverty. You are zeroing in on the religious connection. I think I can speak to that. For one thing, not all religions are the same, just as not all secularisms are the same, as you pointed out. Very true. I would expect a person raised in a Christian home but who abandons the faith in college to have a broadly judeo-Christian set of formative values instilled from their upbringing (insofar as their home was orthodox and biblically based [NT, think, epistles and didactic literature of the Bible]) since most all of us pick up key elements of our self-view our worldview and our value structure through our upbringing. Meanwhile, a Russian, second generation atheist and communist sympathizer is liable to have a vastly different worldview than the one just spoken of. These differences are liable to complicate the correlations. You seem to be referring to fairly successful, materially prosperous western european countries and their secular turn while I’m (supposedly) committing the “no true scotsmen” fallacy in overlooking those and pointing instead towards communist revolutionaries who happen to be atheist. Your point is well taken, and some of it should be retained even as I try to show that you are still off-base. In the cases I just listed, I would expect people who are secular atheists but who had been raised in (otherwise healthy) christian homes to reflect many of the strengths and weaknesses of a Christian upbringing. Though a conscious atheist, that person is liable to be living off of the vestiges of their christian background. i would expect the same thing from a Christian who had been raised atheist. I would expect the various aspects of his worldview to not have a thoroughly interwoven God-belief relevant to morality, meaning, origin and destiny, even if he has converted to Christianity. Now, expand that situation to a society-wide scale and you might see why I think the secular and often atheistic nordic countries are a bad example of independent success/well-being of atheists and secular societies as such. In much of western europe where judeo-christian thought has saturated the various systems its difficult to find an element of culture that has not been heavily shaped by a judeo-christian perspective be it the arts, law, family structures, language, street names, etc. It may take a few generations removal, where the judeo-Christian worldview has ‘worn off’ before we get a good sense of whether those cultures are successful correlate with their secularism or atheism or whether those are accidentally related to that success and their heritage of many centuries of Christianization have instead generated such culturally successful momentum to propel it long after the engine of Christianity has slowed or stopped. Why then would I point to communist atheistic regimes? Well it’s not for the reasons that you’d think. I’m not just looking for bad examples among atheists and singling them out for special observation. No, I’m looking for societies that are thoroughly secular, nearly void of Christian or theistic cultural influence. We cannot see how successful atheism or secularism is if, for example, those are leaning heavily on cultural mores lent overwhelmingly by religious people because of their religion. We need to see if those moral ideals can stand on their own, on wide scale, in the absence of religious people affirming them. Practically speaking, and regardless of the metaphysical grounding issues, robust morality might not survive (much less thrive) unless people broadly fear/respect an ultimately just judge of all actions, or broadly love a good God, or broadly value a pre-fabricated law code from their religous tradition. Now, morality might stand up just fine without religious or theistic reinforcements, but if religion is always hanging around then it ruins the experiment and undermines the opportunity to prove that people can and do retain robust morality without having God in the picture. From the few and incomplete examples we have of thoroughly secularized societies (or attempts at secularization) the numbers don’t, generally, look good. Now I have in mind some pretty damning examples, but if you know of any societal experiments that I’m not considering please share. I don’t want a biased sample, but I’m not enough of historian to be confident that these are the best or leading examples of a thoroughly secular or atheistic society. In my understanding, some of the prominent examples would be the U.S.S.R., People’s Republic of China, Fascist Italy, Communist Cambodia, and North Korea. North Korea for example would be a really good example (so far as we know, the place is pretty closed off), since they effectively abolished churches and many religious influences yet survived well into the second generation of their secular takeover. The U.S.S.R. also lasted only 70 years, but was the longest lasting atheistic regime. Their long history of Russian Orthodoxy, in theory, could have died out in influence in that time, thus leaving a window where most people were not raised in a realm deep religious influence in culture. All of these have their intermixture of non-secular/non-atheistic influences so I’m not touting these are pure or perfect examples. But I’m open to suggestions, objections, and counter-examples. So, your god is not actually at the wheel then. You can thank him for all the good, convenient things he gives you, but you can’t hold him accountable for any of the bad things in the world, even those he created, or those he knew would befall humanity. You blame humanity. But humanity was created by your omniscient, infallible god, thus he knew the results and proceeded anyway. He wiped us out and still got it wrong. He also granted you favors (“prayers”), many of which contribute to this poor child’s suffering. You pray for the health of your family. He grants this, and there is less food for the hungry, as it goes to fulfil your wish. Your church congregation all prays for the same thing for their own families. Your god grants this, and this child’s village starves as a result. Your god is to blame. Your god created, supports and relies on this imbalance. There is literally nothing intelligent about that. TGBX, you sound fired up. That makes sense. This is an emotionally charged topic. Did you have a Christian or perhaps theistic upbringing? Your comment suggests that you believe God could not possibly find redeeming value in many of the atrocities we find on this planet. So, I’m wondering what kind of “God” you have in mind? Is this the Christian God? The God of Islam? Perhaps some glorified human-like intelligence who basically would never operate in ways that surprise us or contradict our preferences? Sometimes people are working from a self-styled theology where “God” looks different from any of the major Christian traditions. So, I’d want to make sure we are talking about the same God here, as you and I probably agree on the non-existence of most every “God” out there. In other words, I don’t want to launch into “answer mode” before I have a sense of where you are coming from.